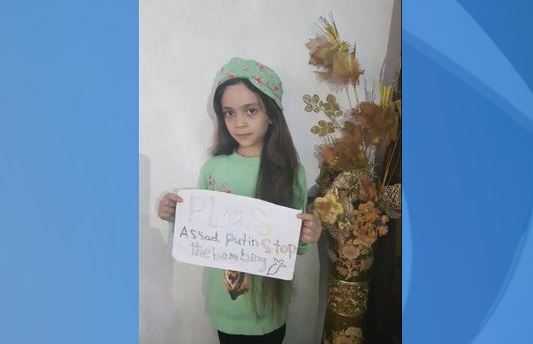 ALEPPO, Syria (CNN) — Bana Alabed, a 7-year-old Syrian girl who captured the world’s attention with heartbreaking Twitter posts about the bombing of Aleppo, disappeared from social media on Sunday. Her Twitter account was deleted and nobody knows why. That same day Bana tweeted asking for people’s prayers amid fresh bombing. “Under heavy bombardments now. In between death and life now, please keep praying for us,” she said. Her mother later told CNN their home took a direct hit and put them into the street. But the Twitter account remained active, until Sunday. Most striking were the videos that captured the sound of bombing. Bana spoke to the camera and asked for help. They live in the rebel-controlled sections in the eastern part of the city, which has come under heavy bombing by the Syrian regime and Russian warplanes. On Monday, messages of support were posted to Twitter, praying for Bana and her family’s survival. Despite several ceasefires, the conflict in Aleppo has intensified in recent months, with hundreds of thousands of people fleeing the city. Syrian troops backed by militia gunmen loyal to President Bashar al-Assad entered eastern Aleppo on Saturday and have seized the entire northeast. They are now in control of more than 20 percent of eastern Aleppo.